Ryan Kilgo, AUP Unit at The Citadel Class of 2007, shared some of his experiences in AUP before it was even called "AUP". 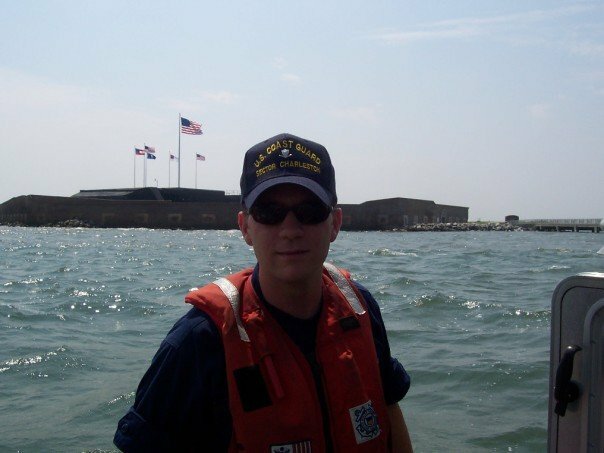 Ryan Kilgo, then a cadet at The Citadel and a Reserve MST3, underway off of Ft Sumter in Charleston, SC. Newly minted ENS Kilgo (on right) with CWO Tom Gelwicks at Officer Candidate School (OCS) graduation. Then LTJG Kilgo photographed during his first tour as an active duty officer at MSU Houma. 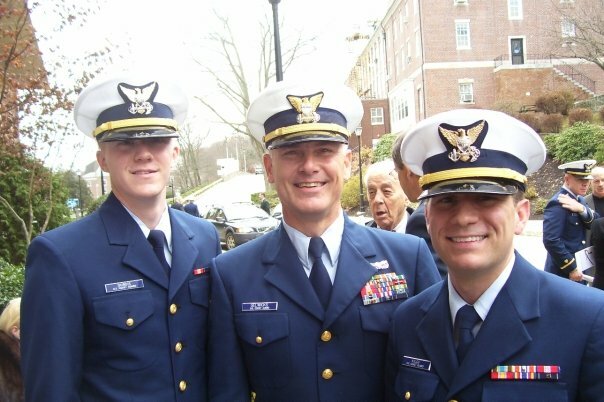 In September 2006, nearly forty cadets at The Citadel, The Military College of South Carolina, met in a small conference room with one thing in common: an interest in the Coast Guard. A corps-wide e-mail invited anyone attracted to a career in the Coast Guard -- whether Officer or Enlisted, Active Duty or Reserves -- to meet in Mark Clark Hall. 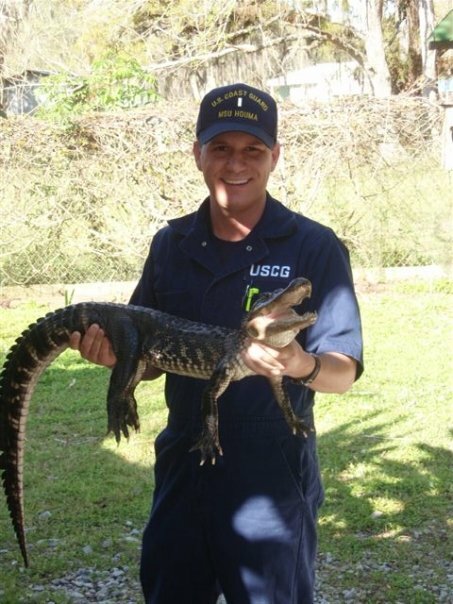 In attendance was Lt. Ryan Kilgo, who, at the time, was a senior on Regimental Staff and an MST3 in the Coast Guard Reserve. Kilgo recalls, "Ryan Finn, a friend of mine who was thinking about enlisting in the Coast Guard, called the meeting. When I arrived I saw cadets in every seat and even standing along walls. After the meeting, I turned to Ryan and said, 'We need to do something with these names on your roster.'" The two cadets later met in the Cadet Activities Department to register an official Coast Guard organization on campus. After developing a constitution and recruiting the supervision of The Citadel’s first Coast Guard Tack Officer, Chief Warrant Officer Tom Gelwicks, The Citadel Coast Guard Society was established. As the Society’s senior cadet, Kilgo served as its first Commander and began to organize meetings and invite guest speakers. Three days before graduating from The Citadel, Kilgo learned he and his college roommate, Brian DuBois, were both selected to attend Coast Guard Officer Candidate School in the fall. On December 12, 2007, the newly commissioned Ensigns received their first salutes from their mentor, CWO Gelwicks, before they headed off to opposite ends of the United States. Lt. Kilgo was assigned to a Marine Inspections billet in Houma, Louisiana and Lt. DuBois was assigned to serve aboard the Coast Guard Cutter Mobile Bay in Sturgeon Bay, Wisconsin. LT Kilgo now serves as the Senior Investigating Officer at Marine Safety Unit Pittsburgh. There, he oversees all marine inspections and investigation activities. Previously, he was the AUP Innovation Program Manager, and as the alumnus recognized as being “AUP’s First Graduate”, made great contributions developing the program that it has become today. He is happily married and has an energetic 13 month old son.